Children's author David Elliott creates characters who are much like the author himself: full of humor, full of heart, and just the tiniest bit subversive. I know this for two reasons: first, because David is a friend of mine, and second, because I never miss an opportunity to fall in love with one of the characters he's created. My love affair started with Roscoe Wizzle, the boy who took on corporate greed and corruption when he discovered that fast food was turning him into a bug in The Transmogrification of Roscoe Wizzle. Then it was Evangeline Mudd, the intrepid daughter of primatologists, who taught me the word "brachiate" (now one of my favorite words - you'd be amazed how often it comes in handy) in Evangeline Mudd and the Golden-Haired Apes of the Ikkinasti Jungle. And now there's Jeremy Cabbage. 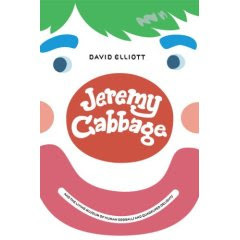 Jeremy is the hero of Jeremy Cabbage and the Living Museum of Human Oddballs and Quadruped Delights. When we meet him, he is an orphan living at Harpwich's Home for Mean Dogs, Ugly Cats, and Strey Children, a joyless institution in a joyless city - the Metropolis, under the miserly rule of Baron Ignatius Fyodor von Strompie III, whose own sunny and luxurious home at Helios stands in stark contrast to the dilapidated and colorless world beyond its gates. As we get to know the Baron, we discover that the conditions in the Metropolis have developed less because he is purely evil, and more because he is short-sighted and focused solely on his own self-interest - which makes his style of leadership seem all too familiar in the modern day and makes the plight of the citizens of the Metropolis hit just a bit too close to home. Through their response, Jeremy and his friends - which include a sapient pig, a wuman cannonball, and a couple tattooed with every word in the English language - remind us about the danger of passivity, the insidious nature of intolerance, the power of community, and the responsibility we have to choose to do what is right over what is safe. There's another theme in Jeremy Cabbage that also hits close to my heart. It explores how we, as parents, hold dreams and expectations for our children when they are born, but sometimes discover as our children grow and develop that our real-life children are very different from the children of our imagination (does this sound familiar to anyone else?) Jeremy reminds us that our mission as parents is to love our children not in spite of who they are, but because of who they are. As one character explains, when asked why he'd want to adopt a waif like Jeremy, "Why does anyone want a child? To love, of course." To love, indeed. You'll be hearing a lot more about Jeremy Cabbage in the future; the movie rights were optioned by Fox 2000 long before the book was published. But don't wait to be introduced to Jeremy and his friends on the big screen. Get to know them now, in depth and on paper - and be prepared to fall in love. Thanks for this----on our California trip, Charlie has been showing more interest in books. So far, he' mostly been looking at a battered copy of Goodnight Moon but something new's always worth it. What level are these written to? Buddy Boy (same age as Bud) has started to read some stuff for fun, and we're always looking for stuff that would interest him. This stuff sounds like it would be right up his alley. Joe, both Roscoe Wizzle and Evangeline Mudd are geared to ages 7-10. Jeremy is geared to 8-12. Bud could probably manage them based on his reading level, but I think they would lose him based on his comprehension skills. I'm not sure where Buddy Boy is with that. David has some other terrific books that are geared to a younger age group. I just got a copy of another new book of his, a graphic novel called Wuv Bunnies From Outers Pace (ages 6-10), but haven't had a chance to read it yet. At first glace, I think Bud might like it because it's fully illustated, though it plays with language in a way that might confuse him. (I'm hoping it will give us an opportunity to meta-communicate about language, actually.) David has a bunch of wonderful picture books as well - you can see them all here. Kristina, as you know, Bud has always been a huge fan of Goodnight Moon. You might want to give David's picture book And Here's To You! a try with Charlie. It has the same "instant classic" feel as Goodnight Moon. In fact, it's one of my very favorite books of all time. Bud loves it, too. Thanks for this post momnos. I've fallen behind in my Elliot reading! (And in my momnos reading too) I love David's character names almost as much as his "subversive" streak. I'd asked him to sign a copy of Roscoe Wizzle for me a few years back to give as a gift. I remember hearing David talking about movie rights and stuff. How cool! Miss M needs some summer reading, and has a Borders card burning holes in her pocket.